The create command now gives you the option of using an existing service instance of your IBM Cloud account in addition to the choice of creating a new service instance for your application. Invoking the delete command from the folder of your application that contains the cli-config.ymlwill now detect the corresponding application in IBM Cloud and allow you to delete it. Simply change to this folder and invoke ibmcloud dev delete. In this release, we’ve made it easier than ever to connect your local application to the corresponding application on IBM Cloud. If you are logged into IBM Cloud, the enable and edit commands now allow you to choose whether the local application should be connected to an existing application on IBM Cloud, a new application should be created on IBM Cloud, or should proceed without connecting to an application at all. In order to take advantage of all that the IBM Cloud has to offer, you need an application created in IBM Cloud, not just on your local workstation. However, if you know that you do not wish to create an application in IBM Cloud and are logged in, you can choose this option when you invoke enable, bypassing the above question in the CLI by invoking ibmcloud dev enable --no-create. The enable and edit commands now allow you to connect your app to an IBM Cloud toolchain. This is for the case that you have existing code that is not in a git repository, and you now are connecting this app to an IBM Cloud toolchain which will also create a git repository for you in IBM Cloud. The CLI will guide you through the necessary steps as pictured below. Enable also now better serves applications already tied to a git repository. 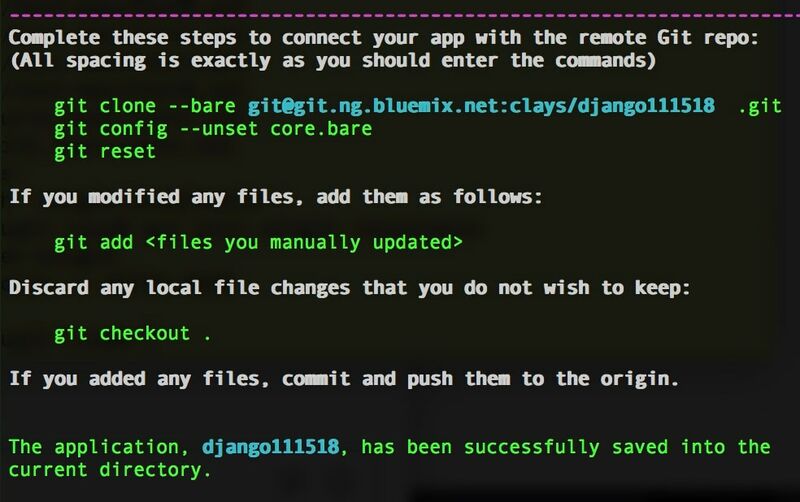 When creating an IBM Cloud application, the existing git repository will be associated with the application in the console, simplifying the task of connecting this existing repository to a toolchain.